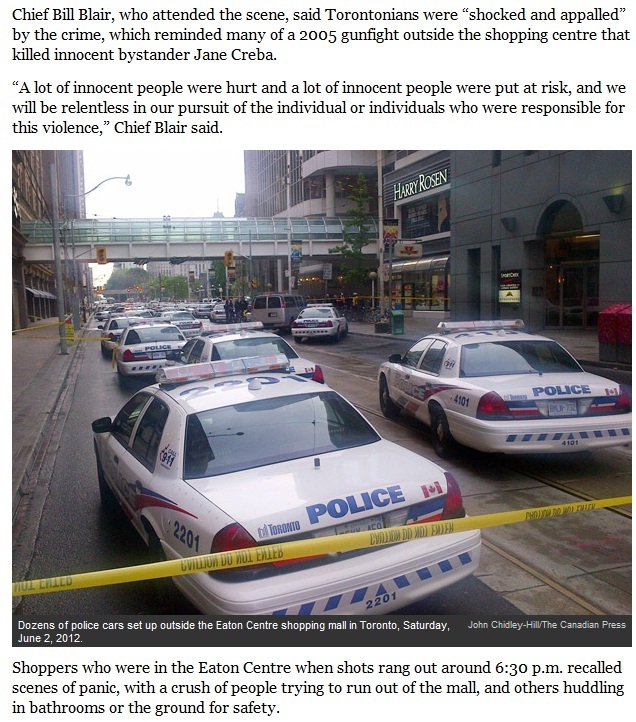 This is the first photo I took on my Blackberry shortly after arriving on the scene at the Eaton Centre shooting, as shown on the National Post's website. One of the best parts of being a journalist is that every day is different. The multiple shooting at Toronto’s Eaton Centre on Saturday was a classic example of how a sleepy afternoon shift can quickly change into one of the biggest stories of the year. 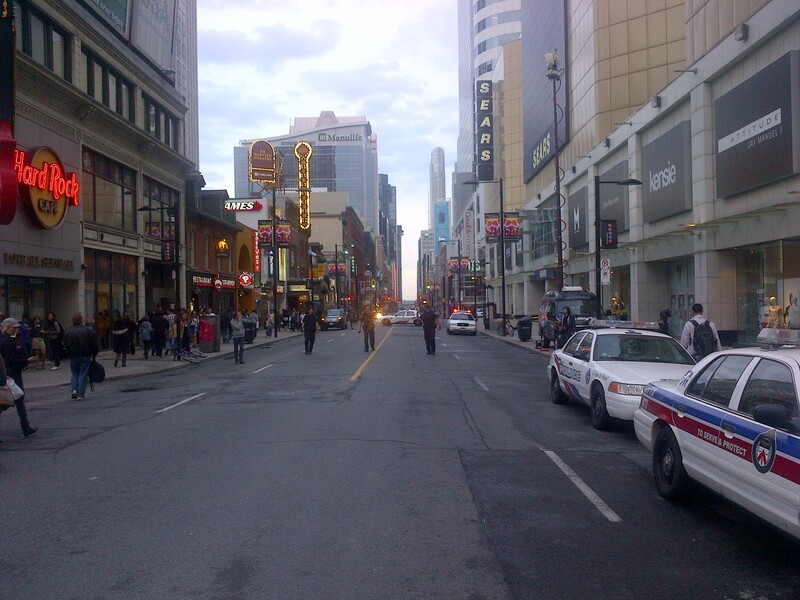 I’d been scheduled to work on the broadcast side of the sports desk from noon until 8 p.m. Around 6:45 we noticed Toronto Blue Jays third baseman Brett Lawrie was tweeting that there were shots fired at the Eaton Centre. Now, keeping tabs on Twitter is pretty standard operating procedure in the sports department. It helps us keep track of breaking news and we can grab quotes for use in our stories. Many athletic associations use Twitter for news releases and, of course, professional athletes love to interact with their fans through it as well. It’s an incredibly valuable resource. Anyway, since multiple shootings is out of the jurisdiction of sports, we told our national/Ontario desk of the news and emailed them a link to Lawrie’s Twitpic and carried on with our business. Newsrooms, however, are supposed to be modular. If a big news story breaks in one department, our goal is to cover it from every angle. If there’s a pressing assignment, then one department can pull staff from other desks to beef up its coverage. Unfortunately, the national desk was short staffed because Saturday nights are pretty slow – well, everywhere except in sports. So with this breaking news, and with my shift winding down (my replacement on the desk had come in), I was pulled off of sports and sent up to the Eaton Centre with video camera and Edirol in hand. When I got to the intersection of Yonge and Queen it was total mayhem. By my count there were at least 15 police cars clogging up Queen Street West, with four or five ambulances. All the cops were out of their cars and hastily setting up a perimeter. At the same time, hundreds, if not thousands, of pedestrians were on the street. At first, most of the civilians were running or jogging away from the mall. I assume these were people who’d actually heard the shots fired or knew what had happened through word of mouth. But after they cleared out there were still hundreds milling about with cameras and phones in the air, pointed at the command centre the police were setting up at the Eaton Centre’s south entrance. I called in to the national desk to describe the scene to help them put together the initial story. It was a brief call just to let them know that, yes, there was a very real situation with a large police presence and that there were huge crowds of people in and around the mall. After that, I tried to approach a police officer and ask if they had a media liaison person yet. I knew the answer would be no, but people are more likely to answer other questions if the first one is easy. He then told me that they were evacuating the Eaton Centre, that it was a “hot” situation and the shooter was still at large. I shot some video, mainly B-roll stuff of the cops trying to control the crowd, before I moved west along Queen, as close as I could to the main entrance, to get a good framing shot of the police standing outside of one of the mall’s main entrances. I reached over the police line to try and get the best shot possible and, suddenly, a cop was on me, shouting. He crossed under the tape, turned me around, and started shoving me back towards Yonge Street. Now, I’ll allow that I shouldn’t have reached over the tape, but I think he was coming down a bit heavy. When he finally got me to Yonge I turned back around to get a look at him and I realized just how scared he was. He was a pretty young guy – maybe about 26-years-old – and, unlike some of the cops, had pulled his face into a grimace. I wasn’t particularly pleased with being shoved down a street, but that’s fine. I can understand that he was tense and stressed out and don’t bear him or Toronto’s police any ill will. At the end of the day, I was the one in the wrong. Anyway, as I stood at the corner the Emergency Task Force arrived in a convoy, giving the impression that there could be more gunfire. I caught their arrival on camera and then called back in to the office to give them an update. After filling in reporter-editor Steve Fairbairn on the latest, I did an interview with broadcaster Bill Marshall to put out on the Canadian Press’ audio wire. It was a fairly standard Q+A session with me describing the situation and giving what little information I had. Steve told me that he’d also called in Paola Loriggio, another reporter-editor who usually works on the Ontario desk. I asked another police officer if there was a media liaison yet and tried to get more details on the shooting. He mentioned that the shooting was in the food court and that he was sure the perpetrator was long gone. Now, normally, the information that the shooting was at the food court would be pretty useless since the Eaton Centre has two – a north one and a south one – but it just so happens I’d been in the mall earlier that day and knew that the south food court was closed for renovations. 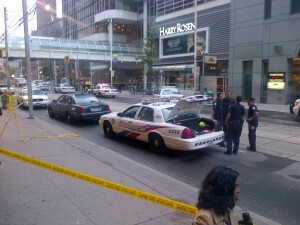 I decided to walk north to Dundas, since that entrance would be closer to what appeared to be the site of the shooting. 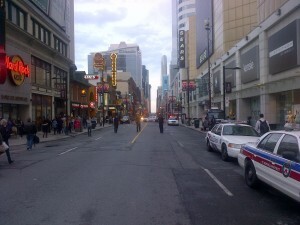 But before I went, I snapped a photo on my Blackberry of all the 5-0 on Queen West. Along the way, I saw mall security letting several customers and staff members out of the building through a fire exit. I also came across a cluster of McDonald’s employees getting instructions from their manager on getting subway fare from another nearby location. This was my first chance at an eyewitness interview. After she was done speaking , I pulled her aside for a quick interview. Although she briefly got nervous, she calmed down when I asked for her name and how to spell it. Turns out I was speaking to Erica Solmes, the prop for the York Lions’ women’s rugby team. She explained that she’d heard about 15 shots and then a stampede started out of the food court and, presumably, out of the mall. After a few follow up questions I thanked her for her time and headed up to Dundas Square where I was to meet Paola. Things were still pretty crowded at this intersection since there was a smaller police presence. Oddly, most of the crowd was facing east, looking at the stage set up in the square for a free opera concert. Paola and I spoke to a few cops, who confirmed that although the shooting was at the Dundas food court, the command centre – and therefore any news conference – would be down on Queen. As we walked back, we saw other members of the media scrumming around a young guy in an Eaton Centre uniform. Paola waded in to the scrum to get her Edirol in close, while I hung back and held the video camera up and over our fellow journalists. This was Marcus Neves-Polonio, a 19-year-old busboy who had fled the shooting after ducking for cover under a table. I felt pretty bad for him, since he was clearly in a state of shock. I’m not sure if it was from the shooting, having a bunch of cameras and microphones in his face, or both. The kid was obviously rattled. After the scrum was done Paola and I continued our walk. The pictures desk had replied to the photo I’d sent them, asking for more. With that in mind, I stopped to take a shot down Yonge, which was clear except for media, police, and some civilians trying to find their way to public transit. When Paola and I arrived at Yonge and Queen we confirmed that there’d be a news conference soon, so I went back to CP’s office to drop off my video camera, email in two more photos from my Blackberry and hand over my Edirol to transcribe Erica Solmes’ quotes. After that, I took a fresh camera out to Paola and called it a night. All in all, it was a crazy but exciting experience. The photos from my Blackberry got wide distribution on CP’s wire and then the Associated Press’ wire. The B-roll and interview with Marcus Neves-Polonio was the first video CP put out and it also got pretty wide play. Erica Solmes’ quotes and some colour I’d called in were incorporated into our main story. All from what started as a quiet, laidback shift on the sports desk.